While a reported third test of North Korea’s submarine-launched ballistic missile (SLBM) system in December 2015 now appears to have failed, an examination of the video of the initial stages of this launch along with commercial satellite imagery of the submarine and support vessels in port two days later, suggests that this test was probably conducted from a submerged barge rather than an actual submarine. The failed launch combined with testing from a barge shows that North Korea still has a long way to go to develop this system. Contrary to some speculation in the media, an initial operational capability of a North Korean ballistic-missile submarine is not expected before 2020. Figure 1. KCTV coverage of the launch. 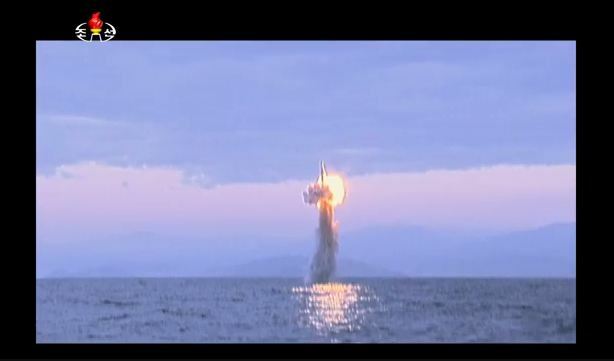 The December 2015 SLBM test. Screengrab: KCTV. In May 2015, North Korea announced that they had launched a missile from a submarine, and it appears to have been from a submersible test barge rather than a sub. We later heard rumors that North Korea tried to launch another missile from a submarine, and damaged the submarine instead. The North Koreans, unsurprisingly, said nothing. Late last month, intelligence reports say there was another submarine-launched ballistic missile test. South Korea says it also failed, but the North Koreans claimed success. Clearly, there’s some disinformation somewhere in the mix. The smart money is to look more closely at what we can see—and if it’s the North Koreans showing us pretty pictures, take a close and skeptical look. North Korea did release a video of the launch, although closer examination of the video itself has revealed inconsistencies that suggest it has been spliced together to show success. But we also have commercial satellite imagery of the Sinpo South Shipyard, and those North Korea can’t fake. So if we take the pictures we can trust, the video that has been edited by people we don’t trust, and the various rumors and leaked intelligence reports, what does it all add up to? What we can learn from the video, is that for just a few frames, peeking out from behind the head of the official to Kim Jong Un’s right, is what looks like the stern of a vessel—consistent in its features with the support ship that is usually berthed next to North Korea’s “SINPO” or “GORAE” class missile submarine in port. The boat appears to be about 50 to 100 meters from the missile launch site. That would be dangerously close to a submarine operating at shallow depth for a missile launch. But it would be just about right, and quite necessary, for a submerged barge. There are other reasons to believe that this was a barge test rather than a submarine, such as the condition of the submarine. 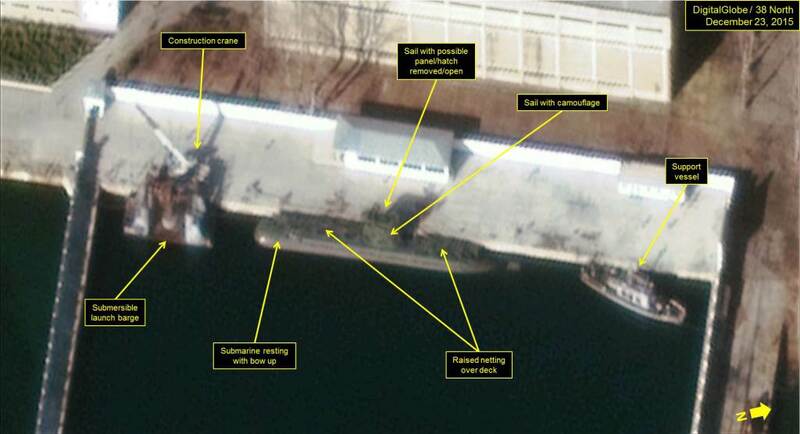 It was reported to have been damaged in the November test; even if it had been repaired since, it is unlikely that the DPRK would risk the boat in another test launch without first double checking the launch mechanism with another barge test. Commercial satellite imagery from December 23, 2015, just two days after the most recent test, also shows the submarine in port with its bow slightly elevated, missile hatch open or removed, and camouflage netting over the sail and deck. It seems that someone is doing repair or maintenance work on the boat. Possibly this is routine post-launch maintenance, but if that were the case, the most pressing issue would be to remove or replace the launch canister, and that would require a crane. Indeed, we see such a crane at the dock—next to the submersible test barge, not the submarine. Figure 2. Close-up of the secure boat basin at the Sinpo South Shipyard. Finally, the launch itself. Unlike the first test, where the missile emerges from the water at a distinct angle, this launch was almost perfectly vertical. This means that if the test had failed—if the engine had failed to ignite—a 10-ton missile filled with potentially explosive propellants would have fallen back on the launch platform. It seems unlikely that North Korea would risk such a test from an expensive submarine until they have verified it at least once from a relatively expendable barge. So the test was most likely from a barge, not a submarine. Did it work? The test appears to have been at least partially successful: the missile was successfully launched from the barge and its engine ignited: that part seems real. North Korean missiles, particularly single-stage missiles using the proven Scud engine, have a very high success rate once they reach that point, so we would normally expect the test to have continued successfully. However, other aspects of this missile are new and untested, the missile might have been damaged during launch, and the North Koreans have edited their film in a way that suggests they are concealing a partial failure. Whether or not this test was successful, the North Koreans will presumably get it right eventually. They know how to build missiles that work, they know how to build submarines that work, and Kim Jong Un seems particularly enthusiastic about both. We anticipate they will keep trying. North Korea is also believed to have solicited unofficial Russian expertise in submarine-launched ballistic missiles in the 1990s, when the Russian government wasn’t keeping such close tabs on what its unemployed rocket scientists were up to. And if the North Koreans are using the old Soviet playbook on SLBM development, that gives us some idea of what to expect. The Soviet Union conducted at least half a dozen barge tests, not just one or two, before moving to submarines. And the submarine test program wasn’t an overnight success either. All told, it took the Soviets five years to go from their first barge test of a submarine-launched missile to their first operational patrol of a ballistic missile submarine. North Korea may have Russia’s old playbook, but they don’t have Russia’s industrial resources and they aren’t likely to find any shortcuts they can afford to explore. So far, they have been following the early Soviet development path, with multiple barge tests, and this latest test merely continues that trend. If they did try to jump forward to an early submarine-launch test in 2014, that apparently didn’t work for them. When we first learned of this program we expected North Korea might develop an operational ballistic missile submarine, of limited capability, by perhaps the year 2020. Based on their progress so far and on early Soviet experiences, and assuming there are no major setbacks in the near future, our estimates remain relatively unchanged.